Kawa Stream is a relatively short (~4.1 km), perennial stream located mostly in the Pikoiloa Tract of southern Kaneohe Town. The main or central branch of the stream arises within the National Veterans Cemetery and the stream eventually discharges into the south basin of Kane`ohe Bay. Kawa Stream has a drainage area of 4.0 km2 (1.56 sq. mile) that includes the National Veterans Cemetery and most of Hawaiian Memorial Park (cemetery), nearly all of the residential urban developments east of Kamehameha Highway from the cemetery down to Kaneohe Bay Drive (Piko`iloa, Kailuapuhi Waikalua Homesteads, Parkway), and the Bay View Golf Course. Although a windward stream, Kawa drains not the steep face of the Ko`olau (in Kane`ohe Ahupua`a the Nu`uanu Pali) but a ridge of hills (called Mahinui) that separates Kane`ohe from Kailua. The highest points on the watershed are two peaks on the ridge at 265 and 287 m (870 and 942 ft; shown in Photo 2; and seen in an aerial photo of Kapa`a Quarry). Adjacent watersheds include Kapa`a (to the east) and Kamo`oali`i (to the south and west). Most of the drainage within Kawa watershed is handled by street storm drains that collect runoff into underground culverts that discharge into the stream. However, several small springs and numerous seeps maintain Kawa's base flow. Extensive parts of the stream channel are highly modified. A discussion of water quality and a listing of aquatic species living in Kawa Stream are provided elsewhere. Following are descriptions of each reach of the stream. The State Department of Health (HDOH) has recently (draft January 2001) completed a bioassessment of Kawa Stream. Like most streams, numerous branches and swales contribute to upper Kawa Stream, but the central branch arises near the water tank above the Veterans Cemetery. The stream channel through the small valley below the water tank is now buried beneath the cemetery lawn (Photo 1). Grated drains collect sheet flow from the upper parts of the lawn and roadways, and direct this flow into pipe culverts and eventually to an outlet structure located just inside the Veterans Cemetery entrance. This part of Kawa Stream may be perennial (PUR) and seeps out into an open concrete box-culvert discharging vertically onto a CRM-lined channel where a pond forms behind a debris dam of mostly California grass (Brachiaria mutica). The "pond" is inhabited by melanid and apple snails (Melanoides tuberculata and Pomacea canaliculata). Flow is discontinuous (interrupted) downstream of this pool. Photo 2. The upper central branch of Kawa Stream arises in the swale now occupied by the Hawaii Veterans Cemetery, seen here from Hawaiian Memorial Park. The stream bed no longer exists in this area. A parallel branch (upper east branch) drains the forested slopes immediately east of the cemetery. This forest is dominated by large and numerous smaller albizia trees (Paraserianthes falcataria) which provide the spectacular backdrop for the Hawaii Veterans Cemetery. Also common, and increasing in dominance downslope is Java plum (Syzygium cumini). The understory here is comprised of shoebutton ardisia (Ardisia elliptica), octopus tree (Schefflera actinophylla), and occasional hau (Hibiscus tiliaceus). 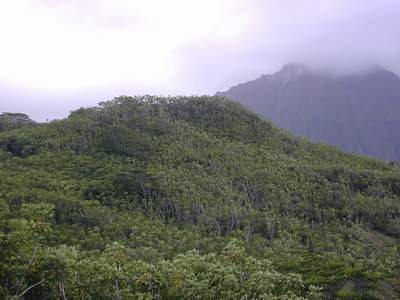 Further east of this swale, the undeveloped hills behind Pikoiloa are mostly covered by an open forest of Schefflera. Groundcover in the albizia/Java plum forest is mostly a growth of basketgrass (Oplismenus sp.) and wood fern (Dryopteris sp.). There are also some garden plants here: Chinese evergreen (Aglaonema sp.) and an unidentified heliconia (Costus sp.) that suggest plantings made along an old track or road cut which parallels the normally dry swale. Although the incision of a channel is evident in the forest floor, this lacks a distinct bed and is completely covered with basket grass. This swale is joined by at least one other from the east, then joins the central branch just above a new culvert crossing constructed by Hawaiian Memorial Park for it's expansion annex. Scattered, small pools of water inhabited by melanid snails, are present just above the new cemetery annex road and box culvert. The forest here is mostly Java plum and an occasional mango (Mangifera indica). Although again only small, isolated pools are present below the box culvert, the channel of the stream is clearly evident as a steep sided incision 0.5 to 1 m deep. Downslope, this channel disappears into a grove of hau just above Kumakua Place in Parkway. Stream flow emerging from the hau is directed around the houses on Kumakua Place between two parallel hollow-tile walls. Here, the normally dry stream bed is overgrown with California grass. This "channel" terminates above a basalt rock face some 8-10 m high, partly covered by colorful arabian balsam or busy lizzy (Impatiens wallerana). Another branch (upper west branch) arises in a swale behind the Hawaiian Memorial Park base yard (behind the upper end of Leleua Place). The margins of the ravine at the head end are quite high and steep. A cataract or (intermittent) waterfall below Kumakua Place (Photo 3) marks the start of the perennial, middle reach (UMR) of Kawa Stream (central branch). More or less permanent seeps contribute to small pools among boulders at the base of the cliff and the stream bed is over-grown with neke fern (Cyclosorus interruptus). The upper cataract on Kawa Stream (central branch) is over-grown with grasses and impatiens. 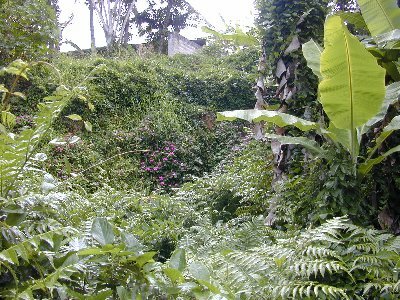 During rainfall amplified flow, water enters beside the concrete block wall at top center and exits through the ferns to the left. Base flow arises from springs at the base of the cliff. Stream flow from below the cataract is steady but weak through a steep sided gulch covered in Java plum and numerous juvenile cinnamon trees (Cinnamomum sp.) on one side; and mostly banana (Musa x paradisiaca) behind houses and yards on the other. Stream flow is directed into a concrete collection chute (Photo 4) just behind Parkway Community Center. It is at this point that the central branch is joined by the upper west branch. Base flow in the upper west branch sometimes appears greater than that in the central branch. The upper west branch of Kawa Stream arises behind the crematorium at Hawaii Memorial Park. The head end of this swale is high and very steep sided, probably reflecting the same resistant geological formation that forms the cataract on the central branch. Downstream, the swale margins are not so nearly vertical and are heavily forested in mango. The stream is perennial and tumbles over a basalt boulder bed, in places incised 1 to almost 2 meters into the valley floor. It exits the swale onto a leveled lot behind the Parkway Community Center swimming pool. The stream flows first into a shallow pool, is directed around the margin of the lot, then tumbles over a wing wall onto a concrete chute (Photo 4), joining the central branch. Both `o`opu (Awaous stamineus) and puntat (Clarius fuscus) have been sighted in the stream pool behind the Community Center. 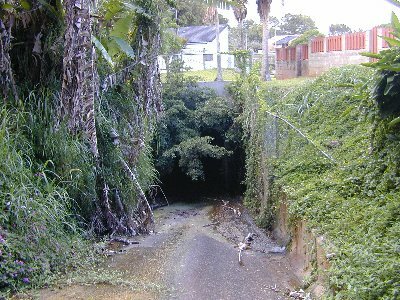 Both the central and the upper west branches of Kawa Stream are directed into a box culvert under the Parkway Development. During periods of low flow, the water from the right (central) branch enters mostly through a small pipe set into the wing wall; that from the left branch cascades down the wingwall on the opposite side.